The majestic elk, also known as the Wapiti, is commonly associated with northern areas of the United States and up into the central and western provinces of Canada. 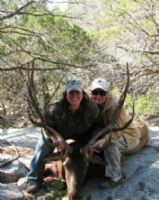 Many hunters are surprised to find that elk have adjusted and acclimated very well to the Texas weather and terrain and that trophy elk hunting is offered at Escondido Ranch, right in the heartland of the Texas Hill Country. The best time of the season for bull elk hunting is the fall months of September through the early part of November, however winter hunts are also very successful. Bull elk tend to be most vocal and active in the early fall as they come into the rut, which makes them slightly less wary and more likely to move about on the game trails and around the feeders in search of the cow elk coming in to feed. Once you move into the first part of the New Year they are still moderately active, especially in warmer winters where they continue to move about later than normal. After the warmer spring weather appears and the breeding season winds down the elk shed their antlers and won't start growing them again until the summer. Trophy elk hunting is a one of a kind hunt, these huge bulls can weigh over 700 pounds at maturity and stand a whopping 5 feet tall at the shoulder. Their bodies are over 6 feet from nose to tail. The antlers you will find when trophy elk hunting typically are very wide, palmate and of outstanding quality for an antler mount or a full head mount. These head mounts are really show stoppers and are guaranteed to fill that spot over your fireplace or in your trophy room. Large bull elk antlers can have eight or nine tines on each antler and with the width of the antlers this is a really impressive and memorable addition for any hunters collection. Trophy elk hunting takes both skill and an ability to call the bulls into the areas where blinds have been set up. The guides at Escondido Ranch will call the bulls in by either bugling to draw them out or by calling the cows that in turn will bring in the big bulls. While most hunting is done at the feeding areas, there are blinds set up at the river crossing that also pose excellent trophy elk hunting opportunities. 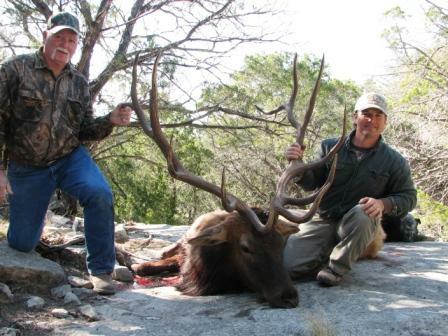 Hunting the trophy elk on Escondido Ranch has its definite plusses. 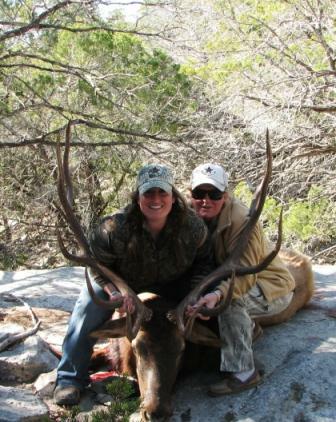 The game managers at the ranch only allow a very limited number of hunts per year. 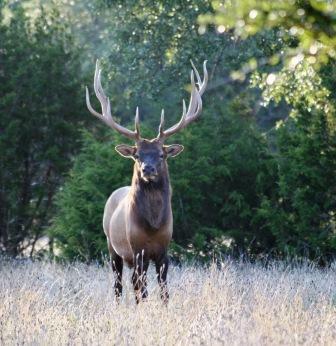 Year round good grazing, lots of fresh water from the river and careful conservation of the herd ensures that the trophy elk hunting at Escondido Ranch is everything a hunter could ask for.